Creative Techniques for Photographers, Artists, and Designers. I used to think that Adobe’s Photoshop was the only available advanced creative tool of its kind. And, if you deal with graphic arts people, you might think that too. However, there is a free software program named GIMP (GNU Image Manipulation Program) that has many of the same features as Adobe Photoshop and a few that it doesn’t. If you’ve never heard of GIMP, you need to discover it for yourself. Although many people associate GIMP with Linux, GIMP actually runs on a variety of operating systems including Windows and Mac OS X. That’s the first “GIMP has it and Photoshop doesn’t” feature that you need to know about. Since 1984, when the first little Mac Classic hit the market, graphic designers assumed that Mac was the only creative platform. Adobe attempted to change that by offering Photoshop on Windows. And, sure, some designers use Photoshop on Windows now. When Linux became more mainstream, a few clever programmers decided that it’s time that its users have a first class design tool like Photoshop. GIMP was born. Now, you’ll find Linux-powered GIMP stations in Hollywood, in major design firms, architectural offices and in homes. Since GIMP has become such a widely used graphics manipulation tool, someone needed to create a good book about how to use it. 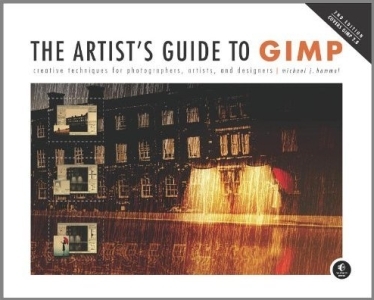 Several books exist that teach users how to use GIMP but The Artist’s Guide to GIMP is unique: It’s aimed directly at creative professionals as well as home hobbyists. The major problem that this book solves for the reader is that it teaches you how to get the effects and fixes you need on digital images. Face it, digital photography is cool and perfect for the hedonist in us all but do we always take the best photographs with our new $1,000 digital SLR cameras? Certainly not. GIMP comes to your rescue. Author Hammel shows you how to fix, manipulate and perfect your images. One of my favorite tutorials is the one he calls “Miniaturizing a Scene.” This is the Tilt-Shift effect that you’re able to get with the old 4×5 format bellows cameras. Today’s cameras can’t quite recreate that same look. But, with GIMP you can come pretty close. In my opinion, his tutorial on photo restoration is worth ten times the price of the book. Hammel takes you through the entire process of taking an old folded, discolored photo and making it look like you captured it five minutes ago using your new DSLR on monochrome mode. That six pages could put you into your own lucrative photo restoration business. You’ll need a quality scanner, GIMP, The Artist’s Guide to GIMP, 2nd Edition and some business cards. If that weren’t enough, he also shows you how to take a regular photo and give it an antique look. The same goes for digital photography. The magic happens in the digital darkroom or GIMP, as I like to call it. The book is a different format than other No Starch Press books that I’ve seen. This one is in landscape mode and has a real photograph on the cover. Its 300-ish pages would fill 500 in standard format. So, put on your reading glasses, fire up GIMP on your computer and start working on those photos. Red light not needed. The book also includes non-photographic techniques as well. Hammel shows you how to create web graphics, type effects and much more. It would be hard to find someone who knows more about practical GIMP use than Hammel–he has it down. He also knows how to teach you. If I could find one thing wrong with the book, it’s that the format is a bit awkward to use for me. I know why No Starch made it in landscape mode–so that you can have it open while working with it and not have to hold the book open. I get that. But, for me it’s a little flippy-floppy and hard to control, when reading it. There’s no perfect format for a book like this except maybe spiral-bound but they aren’t as durable. In all, it’s a very good book. You don’t have to read it from front to back–you can hunt for an effect or a fix and use it by itself. I’d like to see some accompanying videos because some of the techniques just don’t come across well in book format so having that extra resource would be very helpful. If those videos are, in fact, available and I just didn’t see them, I apologize in advance and I’ll add a link to them, if needed. I highly recommend this book for anyone who wants to learn photo manipulation, advertising style and creating your own web graphics, such as buttons, logos or mouseover menus. In all, very well done.